THE CONTROVERSY that surrounded the president, Mr. John Agyekum Kufuor's three nominees, which led to withholding of their endorsement until they were approved by the majority in parliament last Thursday through what was called 'secret balloting' even though it was an 'open balloting', is not going away. The argument took a different dimension when the chairman of the Appointments Committee, Hon. Freddie Blay, and the minority leader of Parliament, who is also the ranking member of the vetting committee, Hon. Alban S.K Bagbin, clashed on the reports of the Sub-Committee on Joy FM's Front Page programme last Friday. As the former lauded the performance of the sub-committee of the Appointments Committee, the latter dismissed it and noted that the mandate given to them was narrow; and hence inadequate work was done. Mr. Bagbin argued that if the report from the sub-committee was given the vetting committee for further work to be done, the result would have been different. According to the Minority leader, in the case of Hon. I.C. 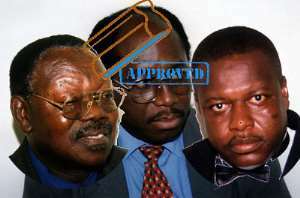 Quaye, the nominee had deceived and misled Parliament with forged documents. To this end, he said there should be sanity in the process, adding that what the minister did was tantamount to contempt of Parliament. The Minority leader indicated that his beef was that though it was not all that necessary for one to possess a certificate before handling a ministerial portfolio, the vetting committee would have done better on the case of the three nominees, especially, the Greater Accra Regional Minister, who choked on his CV during his vetting. Hon. Freddie Blay, who was full of praise for the work done by the vetting sub-committee, as well as Appointments Committee as a whole, stated that his working pal was only playing on words instead of looking critically on the work done. Responding to the case of Hon. Edumadze, Hon. Bagbin noted that when he appeared for the committee he gave bizarre answers, which needed to be investigated. “In the case of Edumadze, the issue that was raised was an allegation that he demanded a construction of a four-bed room house from one contractor. This, he denied and I said no, because his explanation on how those blocks were sent to that man's yard, and were retrieved from the yard? Because the allegation was that, failure of the contractor to construct a house for him caused Edumadze to terminate the contract of the man,” stressing that when Hon. Edumadze came before the vetting Committee, he gave some bizarre explanations. “In as late as April 2004, he wrote a letter because he had not refused or terminated his contract. I am not saying that, (referring to the words of the minister) the whole country was watching,” these were the words of Hon. Blay in defense of the Minister. He said when a contractor was given a job with mobilization money, at a certain stage of the project, the contractor will raise a certificate, but with regards to this man, he had refused to adhere to that even in the midst of several warnings but was quick to add that if there was something that happened behind the scenes, he would not know until there is any other facts contrary to the official document, which the minister read to the committee. “I am surprised that he is saying this and that is why I insisted on the play back of the recording. If given a contract of ¢4.7billion and you are given a mobilization money of ¢1.2 bilion and was able to complete 26% of the contract, then how come that you are terminating it because the man is not doing the job?” Bagbin bounced back in response to his colleague's explanation. The two legal luminaries also debated on the moral issues regarding Dr. Anane.